The City of Dallas and the Dallas metropolitan area is home to teams in six major sports: the Dallas Cowboys (National Football League), Dallas Mavericks (National Basketball Association), Texas Rangers (Major League Baseball), FC Dallas (Major League Soccer), Dallas Stars (National Hockey League) and Dallas Wings (Women's National Basketball Association). Dallas area major college sports programs include Patriots baseball of Dallas Baptist University located in southwest Dallas, and the Mustangs of Southern Methodist University, located in the enclave of University Park. Neighboring cities Fort Worth, Arlington, and Denton are home to the Texas Christian University Horned Frogs, University of Texas at Arlington Mavericks, and University of North Texas Mean Green, respectively. Nearby Arlington, Texas is the new home to the Dallas Cowboys of the National Football League. Since joining the league as an expansion team in 1960, the Cowboys have enjoyed substantial success, advancing to eight Super Bowls and winning five. Known widely as "America's Team", the Dallas Cowboys are financially the most valuable sports franchise in the United States, worth approximately 2.3 billion dollars. They are also the most valuable sports organization in the world. In 2009, the Cowboys relocated to their new 80,000-seat AT&T Stadium in Arlington, which was the site of Super Bowl XLV. The college Cotton Bowl Classic football game was played at the Cotton Bowl through its 2009 game, but has moved to AT&T Stadium. Multiple different teams were referred to as the "Dallas Texans". The Dallas Texans (NFL) played the National Football League for one season in 1952. Another version of the Dallas Texans was a charter member of the American Football League IV in 1960, before becoming the Kansas City Chiefs in 1963. The city is home to the Dallas Mavericks. Their original arena was the now demolished Reunion Arena, but now they play at the American Airlines Center. The Mavericks won their first championship in 2011 led by their German superstar Dirk Nowitzki. The Mavericks have enjoyed having one of the largest fanbases in the NBA, consistently ranking in the top 5 over the last few years[when?] in attendance. They have had a consecutive streak of playoff appearances since the 2000–01 season except for the 2012–13 season, where they finished with an even 41–41 record and out of the playoffs as the 10th seed. The Mavericks returned to the playoffs in 2013–14. Another major team to play in Arlington is the newly-christened Dallas Wings, a WNBA team which relocated to the North Texas market in 2015 from Tulsa, OK where they were known as the Shock. The Dallas Wings will play in the College Park Center inside the University of Texas in Arlington (UTA). Also in Arlington is Globe Life Park, home of the 2010 and 2011 American League Champion Texas Rangers of Major League Baseball. The Rangers are building a new retractable-roof ballpark, Globe Life Field, across the street from their current park, and plan to open the new venue in 2020. The Dallas Rattlers of Major League Lacrosse became the first professional lacrosse team to call the state of Texas home in November 2017 when the league announced its franchise from Rochester, New York would be relocating to Frisco and The Ford Center at The Star. The Rattlers were one of the six founding members of Major League Lacrosse. Dallas Stars at the American Airlines Center. Dallas is the home of the National Hockey League's Dallas Stars since their relocation in 1993. The Stars have won the Stanley Cup in 1999, plus the Western Conference championship twice, two President's Trophies as the top regular season team in the NHL, and seven division titles. The team plays its home games at the American Airlines Center. The team helped popularize hockey in the region, with Valley Ranch in Irving going from just one sheet of ice when the Stars arrived in 1993 to almost 30 in 2010. The Allen Americans, founded for the 2009–10 season, play in the Central Division of the ECHL. Their home arena is the Allen Event Center located in Allen, Texas, approximately 30 minutes northeast of Dallas. The junior hockey Lone Star Brahmas (formerly the five-time defending champions Texas Tornado) of the North American Hockey League play at the NYTEX Sports Centre in North Richland Hills. Previously, the Dallas Tornado played the North American Soccer League from 1968 to 1981, winning the 1971 championship. The Dallas Sidekicks, a former team of the Major Indoor Soccer League, used to play in Reunion Arena, as did the Mavericks and Stars before their move to the American Airlines Center. The Sidekicks currently play at the Allen Event Center in the Professional Arena Soccer League. The Sidekicks will be part of the new Major Arena Soccer League when it commences with the 2014–15 season. ^ Franchise founded in 1961 as the second Washington Senators, based in the US capital. ^ Franchise founded in 1967 as the Minnesota North Stars, based in the Twin Cities. ^ Franchise founded in 1998 as the Detroit Shock; relocated for the 2010 season to Tulsa, Oklahoma as the Tulsa Shock. ^ Does not include three WNBA titles and four conference titles won in Detroit. ^ Franchise founded in 2001 as the Rochester Rattlers. Original franchise dissolved in 2008, with the staff and roster transferred to a new Toronto team but the team's history remaining behind for a new Rochester team. The history of the original Rattlers was accordingly inherited in 2011 by the relocating Chicago Machine. ^ Does not include one Steinfeld Cup won in Rochester. Another version, the Dallas Texans competed in the now-defunct Arena Football League from 1990–1993, after which the AFL team was the Dallas Desperados from 2002–2008. In 2010, the Dallas Vigilantes began playing in the American Airlines Center as a part of the restructured Arena Football League. The Dallas Dragons, a rugby league team formed in 2010, are part of the AMNRL's Western Expansion. The Dallas Fuel competes in the Overwatch League. The Fuel were one of the league's 12 founding teams. During the inaugural season the fuel finished 10th overall with a record of 12 wins and 28 losses. As reported by Olympic news outlet Around the Rings, Dallas was looking at a 2020 Summer Olympics bid. Those in favor of Dallas said that it should be chosen because no major stadiums would have to be built for the games. Dallas has no major Division I college sports program within its political boundaries, although it has one program within its city limits—the Mustangs of Southern Methodist University are located in the enclave of University Park. 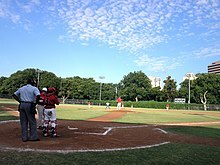 The only Division I team that plays within the political boundaries of Dallas is the baseball program of Dallas Baptist University (Patriots), which plays in Division I despite otherwise being a Division II member. Neighboring cities Fort Worth, Arlington, and Denton are home to the Texas Christian University Horned Frogs, University of Texas at Arlington Mavericks, and University of North Texas Mean Green respectively. Toyota Stadium in Frisco has hosted the NCAA Division I Football Championship, the title game of the second-tier Division I FCS, since the 2010 season, and will continue to host this event through at least the 2024 season. ^ "The Business Of Football". Forbes.com. 2007-09-13. Retrieved 2013-05-11. ^ "#1 Manchester United". Forbes. June 30, 2007. Retrieved May 23, 2010. ^ "Rangers Ballpark in Arlington | texasrangers.com: Ballpark". Texas.rangers.mlb.com. 1994-04-01. Retrieved 2013-05-11. ^ "2010/2011 ALCS Champion". Mlb.mlb.com. 2013-03-12. Retrieved 2013-05-11. ^ "Dallas Sidekicks". Dallas Sidekicks. Retrieved 2013-05-11. ^ "The Overwatch League: Standings". The Overwatch League. Retrieved 2018-12-04. ^ Dallas Diamonds Archived 2013-10-12 at the Wayback Machine – Information from home page. Retrieved on October 20, 2006. ^ "Stadium". Dallasdiamondsfootball.com. Archived from the original on 2013-05-25. Retrieved 2013-05-11. ^ "Dallas Revolution". Dallas Revolution. Archived from the original on 2013-05-23. Retrieved 2013-05-11. ^ "Tokyo Mayor Confirms Bid Desire; Dallas 2020 Rumbling". Aroundtherings.com. 2011-06-17. Retrieved 2013-05-11. ^ "Facilities". Dallasparks.org. Archived from the original on 2013-04-05. Retrieved 2013-05-11. ^ "The Great Trinity Forest-Dallas". The Great Trinity Forest. City of Dallas Trinity River Corridor Project. Archived from the original on January 16, 2009. Retrieved September 12, 2009. ^ "Texas Parks and Wildlife online". Tpwd.state.tx.us. December 4, 2009. Retrieved August 14, 2010. ^ Barker, Evelyn; Worcester, Lea (2011). Images of America: Arlington. Charleston, S.C.: Arcadia Pub. p. 124. ISBN 9780738579818. OCLC 679919858.